People learn best when they experience real life – such as being connected to nature. They often learn on a subconscious level when surrounded by stimulating influences. They learn from interesting people, art, music, dance, creativity, ideas and the humanities. People gather strength from understanding their own heritage. They also learn, however, from exploring and appreciating the best in other cultures. People learn by creating and doing – rather than being force-fed abstract concepts. They then develop their own aesthetic, intellectual and other qualities. Tagore’s views on education were strongly influenced by his own background. So let’s explore the influences that shaped his philosophy. 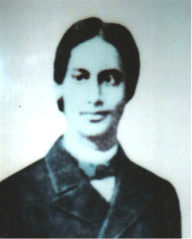 Rabindranath was born on May 1861 into a notable Brahmin family in Calcutta. His parents were Debendranath and Sarada Devi – and he was the ninth son of 14 children. The family had a strong pioneering and cultural history. 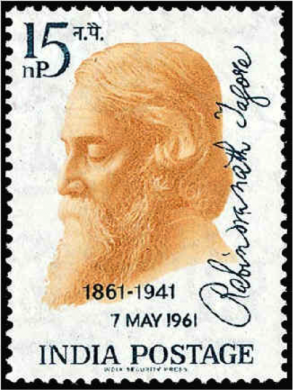 Rabindranath’s ancestors included people who had, for example, taught law in London; introduced orchestral music to India; been patrons of European art; mastered many languages; studied at the Royal Academy; founded universities and theatres; been wealthy landowners; acted as presidents of the British India Association and created their own forms of spiritual pursuits. Some family members played a strong part in the Nationalist Movement and fought for the rights of people in Bengal. 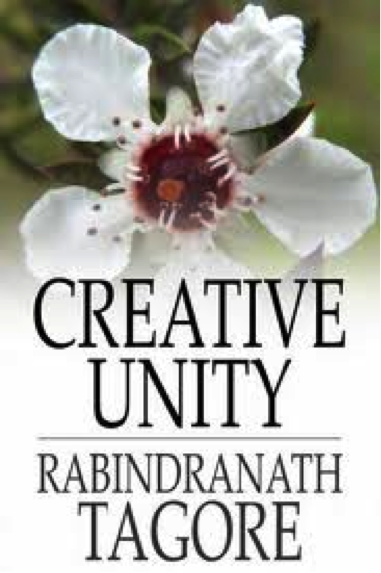 Rabindranath – whose nickname was Rabi – grew up surrounded by artists, music, drama and people from different cultures. Perhaps this explains the beliefs he espoused later about the importance of subconscious learning. 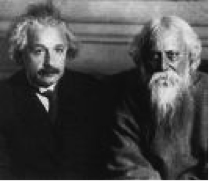 Tagore studied at other schools, but he remained wary of conventional education. He much preferred the joy of pursuing artistic work in a stimulating environment – something he was able to create in the school he later founded. He was twenty-two, she was just 10-years-old. They had five children, only one of whom survived into adulthood. Mrinalini died in 1902. He composed a collection of poems called Smaran (In Memoriam) which were dedicated to her. Rabi and Mrinalini began managing his family’s estates in Shelidah, which is now part of Bangladesh. He then moved to Santiniketan in West Bengal, where his father had founded an Ashram – a spiritual sanctuary. This also became the location for his school. Rabi received income from his inheritance, sales of property and some royalties. Over the next 40 years Tagore produced a remarkable body of creative work. This included poems, plays, music, paintings and social experiments. He also wrote the national anthems of both India and Bangladesh. During this time he was awarded the Nobel Prize for Literature and a Knighthood from Britain. (He tried to revoke the Knighthood after the massacre at Amritsar. A great traveller, he visited over 30 countries on five continents. This enabled him to meet people such as Albert Einstein, Robert Frost, Mahatma Gandhi, Thomas Mann, George Bernard Shaw and H.G. Wells. Towards the end of his life he was awarded an honorary doctorate by Oxford University, the ceremony being held at Santiniketan. Here is an overview of his creative work written by Kanad Malik. “Tagore was a prolific writer and composed about seven thousand poems, songs, short stories, novels, dramas, musicals letters and essays in all. These are very widely read, and the songs he composed reverberate around the eastern part of India and throughout Bangladesh. 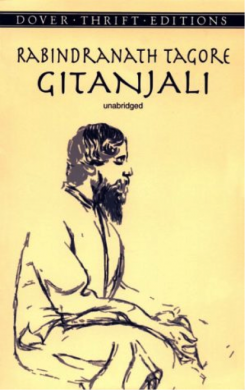 “In his late years, Tagore started painting also and initiated a new style of the art. 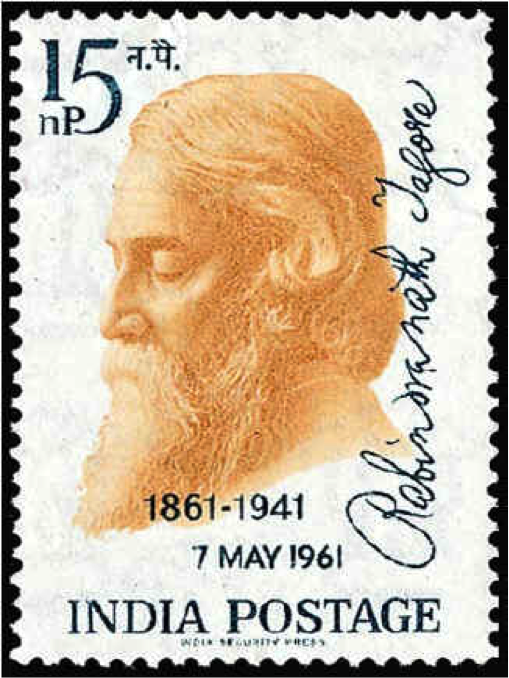 Tagore won the Nobel Prize Literature in 1913 for the English version of his collection of Bengali poems, Geetanjali (an offering in songs). “He is remembered for expressing and analyzing through his extensive literature all possible tenets of human characters and emotions. This is why his work is and will continue to remain relevant to us for times to come. 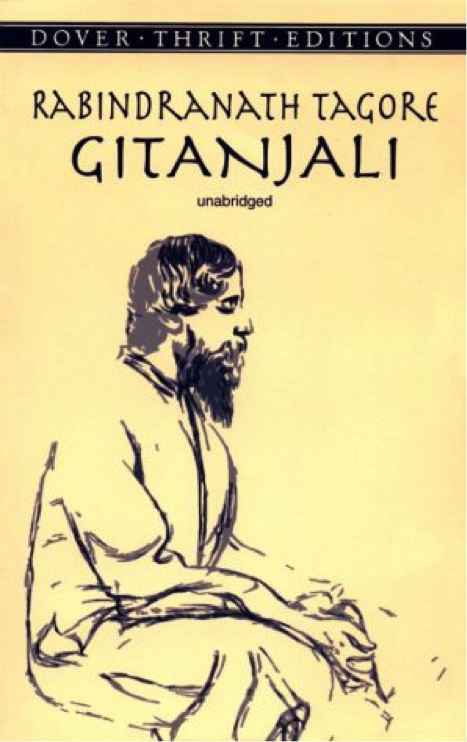 “The profoundly original writer, whose elegant prose and magical poetry Bengali readers know well, is not the sermonizing spiritual guru. “Tagore was not only an immensely versatile philosopher-poet; he was also a great short story writer, novelist, playwright, essayist, and composer of songs, as well as a talented painter whose pictures, with their mixture of representation and abstraction, are only now beginning to receive the acclaim that they have long deserved. Rabindranath continued to travel the world and meet leading figures. Some who had hailed his first work began to criticise him, but he remained revered in many quarters. He suffered several severe illnesses during the last years of his life, losing consciousness for long periods of time. 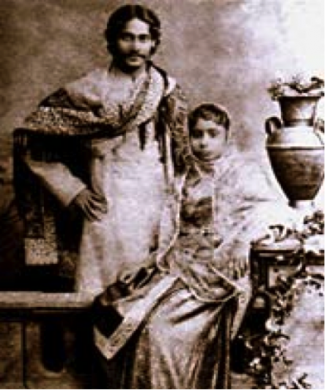 Rabi died in August 1941 at his home in Calcutta – the house where he was born in 1861. He is remembered for many creative works, such as his poetry, stories and paintings. But let’s take a closer look at his educational work at Santiniketan – the ‘abode of peace’. “I selected a beautiful place, far away from the contamination of town life … I knew that the mind had its hunger for the ministrations of nature, mother-nature, and so I selected this spot where the sky is unobstructed to the verge of the horizon. Rabi believed in holding open-air classes. Children could learn from being connected to the rhythms of nature, rather than being separated from these life-forces. It was vital to be aware of Mother Earth – the giver of life – otherwise numbness could come to the soul. Recalling his own childhood, Rabi was anxious to expose children to a rich tapestry of ideas, people, music, art, dance and other stimulation. They should also be able to express themselves, rather than be seen as empty vessels to be stuffed with facts. 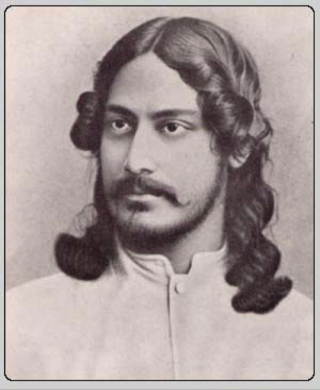 “I am partial to seeing Tagore as an educator, having myself been educated at Shantiniketan. The school was unusual in many different ways, such as the oddity that classes, excepting those requiring a laboratory, were held outdoors (whenever the weather permitted). “Academically, our school was not particularly exacting (often we did not have any examinations at all), and it could not, by the usual academic standards, compete with some of the better schools in Calcutta. “But there was something remarkable about the ease with which class discussions could move from Indian traditional literature to contemporary as well as classical Western thought, and then to the culture of China or Japan or elsewhere. 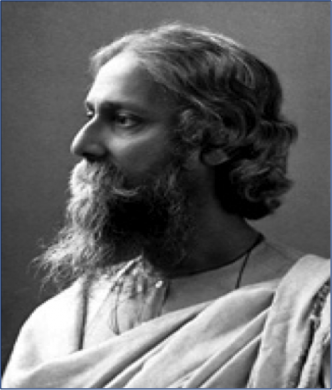 Tagore continues to be revered for his contribution to Asian culture: but let’s take a closer look at the educational principles he followed to encourage people to develop their talents. “But we find that this education of sympathy is not only systematically ignored in schools, but it is severely repressed. People learn best when they experience real life, felt Rabi, particularly when connected with nature. Building on this base, he pursued the following principles to help people express their talents. People learn on a subconscious level when surrounded by stimulating influences – such as interesting people, the arts and ideas. We all learn from our environment – particularly the feelings, sights, sounds and impressions we absorb in our family and school. The best learning places provide stimulation; the worst deaden the soul. Looking back at his own family, Tagore realised how much he had learned from being exposed to art, music and other influences. So he invited artists, dancers and many different speakers to share their work at Santiniketan. This created a rich community. Students were bound to learn – even if it was on a subconscious level. They would then carry these impressions with them into the future. People gain strength from exploring and expressing their own heritage and other cultures. 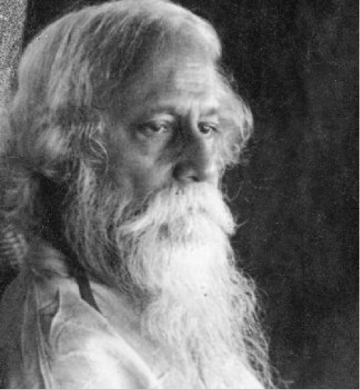 Tagore believed it was vital for people to begin learning in their own language, such as Bengali rather than English. They could also draw strength from taking pride in their own heritage. At the same time, however, there was much to learn from other cultures. “Rather than studying national cultures for the wars won and cultural dominance imposed, he advocated a teaching system that analysed history and culture for the progress that had been made in breaking down social and religious barriers. “Such an approach emphasized the innovations that had been made in integrating individuals of diverse backgrounds into a larger framework, and in devising the economic policies which emphasized social justice and narrowed the gap between rich and poor. Education could enable people to express their true selves, providing they were enabled to create. Students at Santiniketan were encouraged to write, act, dance, paint and find other ways to express themselves. Tagore warned against the industrialisation of education – an approach adopted by many governments. 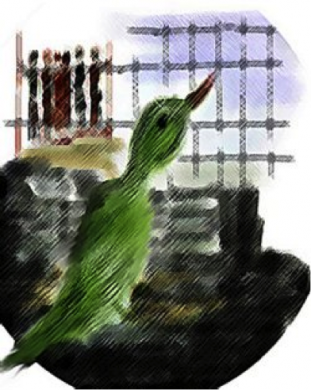 He channelled this concern into a short story called The Parrot’s Tale. The bird died – no one knew when. The bird was brought in. With it came the administrator, the guards, the horsemen. The King felt the bird. It didn’t open its mouth and didn’t utter a word. Only the pages of books, stuffed inside its stomach, raised a ruffling sound. So what have been the effects of Tagore’s educational work? Many see him as contributing to the spirit embodied by pioneers such as Pestalozzi, Froebel, Dewey and Montessori. 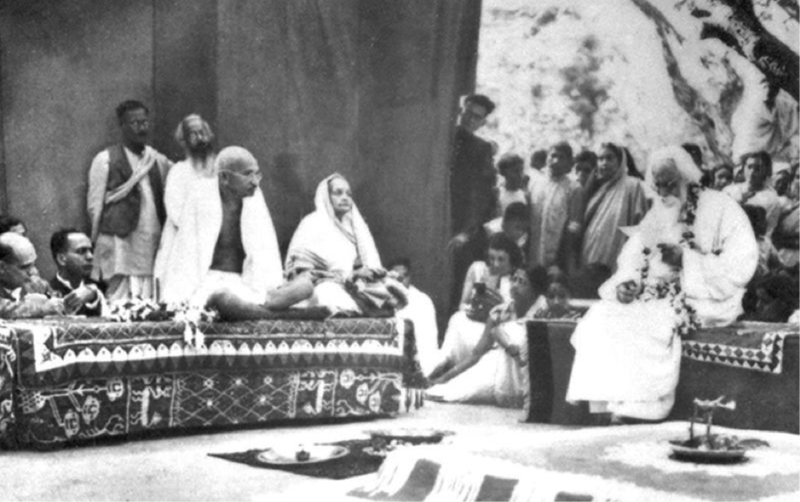 “Tagore’s educational efforts were ground-breaking in many areas. He was one of the first in India to argue for a humane educational system that was in touch with the environment and aimed at overall development of the personality. “Santiniketan became a model for vernacular instruction and the development of Bengali textbooks; as well, it offered one of the earliest coeducational programs in South Asia. Rabi’s work has enabled many people to appreciate life, be more humble and give their best to the world. learning, for he was born in another time. About the quote, could you provide source please! I want to know in which poem or article it was mentioned by Tagore.